Induction loops (or hearing-loops) are a Godsend for the hearing-impaired (with 'T-coil'-equipped hearing-aids). Induction loops may be installed around seating areas in churches and auditoriums, at customer counters in banks, pharmacies, ticket booths, drive-up windows, or even in your television room at home. Induction loops can increase the clarity of the spoken-word by up to 95% over hearing-aids alone. 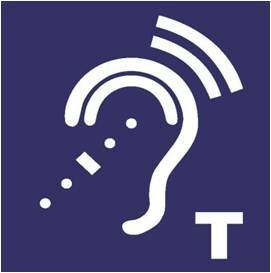 All digital hearing-aids have T-coils inside them, but most have not had the T-coil 'enabled', a service your audiologist can provide. Extremely commonplace in Europe, they are now becoming common in the USA. Many airports are installing them now, as the Grand Rapids, MI airport has. In the West Michigan (Holland-Zeeland) area, they are in use in all facilities that 'get-it'. Roth Electric Sound is certified in the proper engineering, design, and implementation of hearing induction-loops and we have many successful installations under our belt. We can perform a test demonstration onsite at your facility. Properly-designed induction-loops will have evenly-distributed sound-levels throughout the listening area, and it is recommended that you employ the services of a professional (like us) for a successful implementation of this extremely-valuable technology. With many service organizations in a make-or-break struggle for viability in today's economy, having a hearing-loop-system provides an 'extra' reason for people, (especially baby-boomers and older), to attend yours instead of a similar organization without a hearing-loop. Call 877-SOUND-CO (877-768-6326) and speak to Steve to explore this option further.